…but nothing is the same. Today’s repost is from 2007. Life has shifted in countless ways since then yet my emotions are identical to those I wrote about four years ago. I still regard the new year with a sentimental glance back at the old. I’m confident, though, that while my feelings may the same, I am not. I have grown stronger, bolder, wiser and, yes, older. And I wouldn’t want it any other way. How do you feel at the passing of another year? I’d love to hear your thoughts. …not to mention the fa la la la la-ing. The most beloved hymn of the season may be “Silent Night” yet Christmastime is anything but silent. For the most part, I love the noise of it all. From the continual carols to the frenetic hum of the shoppers to the tinkly chime of the Salvation Army bell – the sounds are a familiar, even comforting signal that soon it will be Christmas Day. Still…I think we’re all bound to have days when we’re just a rum-pa-pum-pum away from losing our sanity. At the very least it’s easy to lose our thoughts and lose sight of what all of that noise is for. Today’s “repost” is about the value of silence. I know there are parties for hosting, marshmallows for toasting (or melting for rice krispy treats) and plenty to do between now and December 25th. But I’d like to challenge you to give yourself time, even if only a few minutes, to get away from the clamor and listen to the quiet. You might be surprised by what you hear! May God bless each of you with the peace He has promised. Have a very Merry Christmas and keep reading! With less than two weeks to go before Christmas, chances are you’ve spent time recently in a shopping mall or will be headed there as soon as you realize how few shopping days are left! If you’re like me, you wander through this maze of merchandise and inevitably somewhere between perfume-spritzing elves and sparkly kiosks stocked with trinkets, you get disoriented. Or just downright lost. Thank goodness for the Mall Directory, that color coded map of helpfulness with its little red arrow indicating, “You are here.” There’s something comforting about that sign. And not just because it can direct me to the place that sells those giant pretzels. Have you ever had the feeling that no one knows you’re here? Am I the only one who has ever walked/run/stumbled through a crowded shopping center and felt invisible? Do you ever wish for someone to recognize, as that directory does, that you are here? Then today’s repost is for YOU! Because there’s no better time of year to remind you that no matter how inconspicuous, how insignificant or how forsaken you may feel, you are not unseen. You are here. And so am I. Now if you’ll excuse me, I’ve got to finish my shopping. Or at least get a big pretzel. Click on the photo below for today’s “repost”! …to be jolly. I get that. And I LOVE the holidays! From the smiling pumpkins of Halloween until to the sparkling confetti of New Year’s Eve, I love the celebrations, the decorations, the food, the fun. But today I feel more than a twinge of sadness. My youngest son will be moving away from home just days before Christmas. And my heart aches. I know there are others who feel melancholy this time of year and I tend to be one of those annoying happy people attempting to spread a little cheer. I still hope to brighten this sacred season for those who are hurting. Sometimes, though, you just need to cry. This week marks three years since we said good-bye to a beloved pet. For those who (whether by choice or circumstance) do not have furry family members, such an anniversary may seem insignificant. But this little dog was part of our lives for many years and his passing still brings a tear now and then. Today’s “repost” was written shortly after he left us and it helped me have a good (and much needed) cry this morning. My wish is that you’re filled with joy and happiness this Christmas season. If not, what makes you sad this time of year? And how do you overcome those feelings? I’d love to hear how you’re feeling today (and I’ve got Kleenex if you need them). …from all that hard shopping work you’ve done this morning and do a little mindless blog reading! I hope your Thanksgiving was full of the good stuff – food, family, friends, fun! This has been a difficult year for so many and most of us have struggled in one way or another. Still…I can’t help but feel humbled and grateful when I think of the countless ways that God has blessed me and those I love. My guess is that you found reasons to be thankful as well! If you read my last post, you know that I’ve got big plans for writing in the new year! Until then, I’ll be reposting a few “oldies but goodies” from the past couple of years. This one seemed to fit the bill for today. After all, you want to be comfy while you take advantage of all those Cyber Monday deals, right? If you took a random survey of my friends and family, I’m guessing there would be several words used consistently to describe me. “Rebel” would probably NOT be one of those words. I was always the good girl in school, in church, at home…pretty much everywhere. I just never quite mastered what I considered to be an art – the act of rebelling against…anything. I’m not loud or conspicuous. Nope, on the surface there’s nothing the least bit rebellious about me. But now, just a flick of my wrist might change that idea. In reality, my first major act of rebellion occurred more than seventeen years ago when I summoned all my courage and escaped an unhealthy, destructive marriage. Being divorced, raising three boys virtually alone for much of their lives…I’d never imagined such a life for myself. But then again, I’d never imagined how much strength God would give me when I needed it most. I will forever treasure those days. They were a precious gift. Then in the blink of an eye, those days were gone. My boys became men and although the youngest is still at home, the proverbial nest will soon be empty. A funny thing happens when you’re no longer “needed” quite so much as a mom. You start to realize that it’s been a while since you thought about…you. At first it seemed weird and wrong. Like wearing clothes that didn’t fit quite right. It was just so uncomfortable to focus on myself. But I did it anyway. And a rebel was born. With the encouragement of Lisa, my dear friend and Wellness Coach (once you’ve finished reading here, check her out at http://www.lisacapehart.com/), I began to rebel against lies I believed about my body. I rejected old habits and embraced new possibilities. For the first time in a long time, I’m no longer afraid to look in the mirror. While I was as it, I began to rebel against a few other ideas as well. Nearly a decade after my first marriage ended, I remarried. My dear husband loves my sons as if they were his own and I do not doubt his love for me. But. These years have been filled with circumstances and issues that threatened to tear us apart. Once again, I had to summon all my courage. Not to escape, rather, because I knew my husband’s heart, I bravely reached for his hand and held tight. I will continue to rebel against the forces that would destroy our marriage. But wait! There’s more! I’m a housewife. There I said it. And guess what…I enjoy being a housewife, although I think “Domestic Diva” has a much nicer ring to it. This has been my job for nearly seven years now and I don’t mind giving up a few material possessions in exchange for working at home. Yes, I do work at home. So I’m rebelling against the notion that my life is of no value because I don’t earn a paycheck. Once and for all, I am rebelling against the belief that I have to fit myself into someone else’s idea of what my life should be. I’ll have lots more to write about this subject beginning in early 2012. I hope you’ll join me!! Until then, I’ll be reposting a favorite story or two just for fun. Hmmm…what am I forgetting? Oh yeah, remember I told you that a flick of my wrist my show off my new rebellious nature? Last month I did it. I got a tattoo. 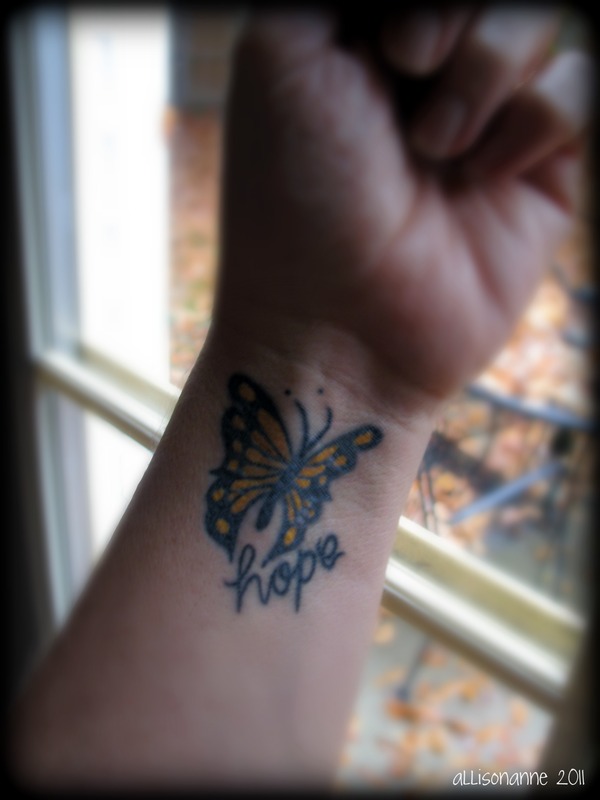 A beautiful butterfly and the word “hope” on the inside of my wrist. There’s a story there for another time. But for now, I like to think of it as the art of rebellion.